When you’re a college student, you might forget there are opportunities beyond campus internships. 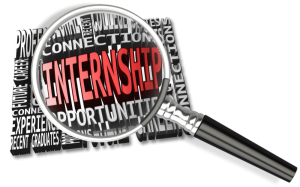 Look up local businesses to see if they offer internships within your field, and don’t be afraid to reach out! As for recent grads, if you have the ability to move around to other cities, broaden your search geographically! For both college students and recent grads, the farther the look, the more opportunities you might come across! Ask your peers, mentors and others within your network if they know about any internship opportunities within your field. They could direct you toward organizations you would have never thought to apply to, as well as possibly help you get your foot in the door. Furthermore, ask your network for help with your resume and cover letter. Those extra sets of eyes when polishing your application can never hurt! There are abundant professional organizations on campus, so take advantage of them, college students! Many of these organizations have “parent” chapters, meaning you will be able to make connections with professions in your field. Recent graduates, you can join the “parent” organizations and further build your network with the new connections. Whether it’s a large conference or a small networking dinner, both college students and recent grads should look for these events to branch out their network. You never know! That person you’re shaking hands with could have an internship available. Clean Up Your Online Presence! Finally, you must clean up your online presence! Internship supervisors will look at you online to make sure you’re professional enough for their opportunity. You don’t want something silly, like a controversial tweet, to take you out of the running for your dream internship! Internship opportunities are definitely out there, ready for the taking! Keep our advice in mind, and best of luck during your search! This entry was posted in Job Seekers and tagged College Internships, graduate internships, Internship hunting, internship opportunities, internship searching, Internships. Bookmark the permalink.